Learn a fun and easy mixed media collage technique using your leftover gift tissue and alcohol markers. 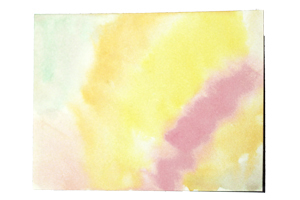 Do a pale watercolor wash on a piece of watercolor paper. 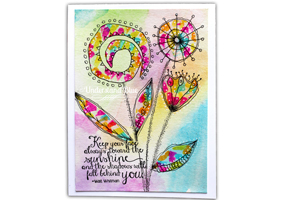 Choose colors which match the alcohol markers you're using - I used matching dye reinkers. Dry with a heat gun to flatten. Hand cut or die cut flower and leaf shapes from the colored tissue paper. 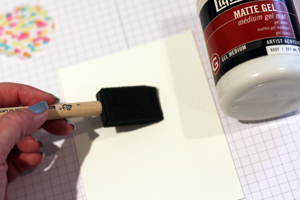 Apply matte gel medium to an area slightly larger than your cut shape with a foam paintbrush. Gently apply the tissue paper to the wet gel medium, smoothing from the center outwards with your finger to make sure there are no wrinkles. 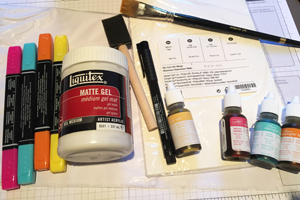 Apply a thin layer of matte gel medium to the tissue paper, being sure to cover completely. Using a thin layer will give you the best results - the tissue is more likely to buckle with a heavier, wetter application of medium. Once all images are applied and the matte medium is completely dry (this is very important for the health of your black pen! 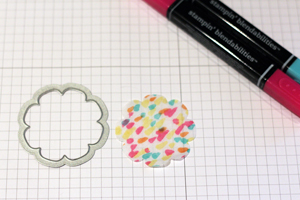 ), begin outlining the tissue shapes and doodling on and around them. 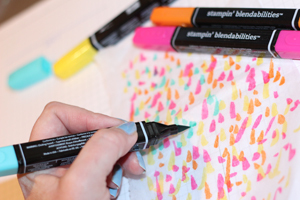 If desired, using the splatter brush or a toothbrush, splatter the panel with white acrylic paint, or add accents with a white gel pen. Finish your card. You've seen the tutorial, now you try it! We've got a section of the gallery set aside for Tissue Paper Collage. Try this technique, then upload your artwork to the gallery. Show us your creations! ***Please note - Internet Explorer/Edge is not a supported browser, and will not allow you to see the videos. Please use Chrome, Firefox or Safari to view our tutorial videos. We'd love to get your feedback or questions. Leave your comment below. What a perfect card! Great job and I will definitely try this out. 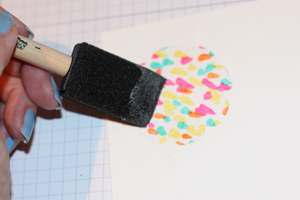 I've never heard of nor seen this splatter brush, but it's a HTH (have to have)! Well this is just adorable and sooooo fun Lydia! I can't wait to try it!!! What a happy card, and I have a ton of tissue paper right now to play with! Thanks for the great instructions! Beautiful card and technique. I was wondering if you could use Hodge Podge instead of the gel medium to glue down your flowers. thank you. Thank you for the wonderful tutorial. Love the Dr. Seuss feel. I didn't see the link to the original website tutorial? Could you please forward it to me. Thanks - I really enjoyed your video. Fran, Mod Podge works too! It will dry with a slightly heavier finish than the gel medium. I just live how you take a blank piece of watercolor paper and turn it into magic! I, too, was wondering if you can use modge podge. The only other stuff I have is modeling paste and gesso. Hi ladies - thank you for your kind comments! You can definitely use Mod Podge to collage things with. I find that in my climate it doesn't work as well - for me it always stays a little stickier, but I know that it is commonly used for collage - any collage medium will work - this one just happens to be the one I like best! Great-great video Lydia---gotta try this now! Thanks for the spatter brush demo. I have had one for years and it has never been used. 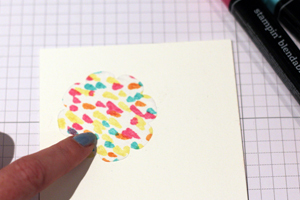 Love, love your tissue paper flowers and zen doodling...a must try! Lydia, this is so cool! May have to be my project for today! Cool technique! Love the whimsy. Never saw that splatter tool before. Where do you get that?? Hi Diane - thank you! The Splatter brush is linked in the supply list above. Oh I love, love this! Great way to start making mixed media art. This IS BEAUTIFUL Lydia!!! It makes me think of Zen tangled too! SUPER JOB!!!!!!!! So pretty, Lydia! I like this technique, that brush is awesome! Lydia Fiedler is a paper arts instructor in Austin, TX and an art blogger at Understand Blue and Project Reanimate. Try an alternate format suitable for printing.